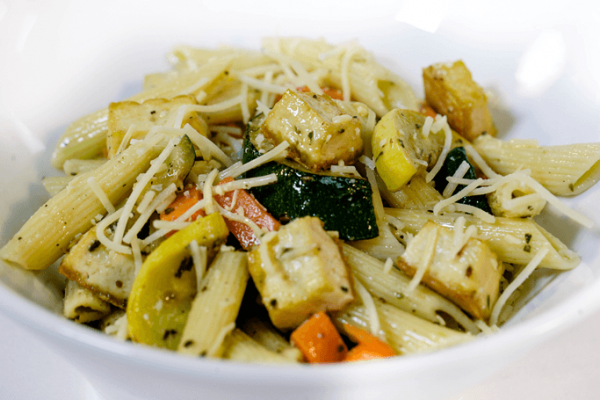 Summer abounds in this colorful penne pasta dish among layers of zucchini, yellow squash, onions, tofu, and carrots. It's tossed in a light olive oil dressing and topped with grated parmesan cheese. This recipe is an authentic recipe from the owners of The LunchMaster, a school lunch meal provider located in California. The LunchMaster takes pride in serving quality dishes and family recipes that have been passed down from generations! 2. On a large heavy baking sheet, toss all of the vegetables with oil, salt, pepper, and seasonings to coat. Transfer the vegetable mixture to another heavy large baking sheet and arrange evenly over the baking sheets. 3. Bake until the vegetables are tender and begin to brown, about 20 minutes total. Stir the vegetables midway (at about 10 minutes). 4. While cooking vegetables, cook the pasta in a large pot of boiling salted water until al dente (tender & slightly firm to the bite), for about 8 minutes. 5. Toss the pasta with the vegetable mixtures in a large bowl to combine. Season the pasta with salt and pepper, to taste. Sprinkle with Parmesan cheese and serve immediately. This dish is delicious and nutritious--it's loaded with a variety of vegetables! For additional recipes that you can make with your children, please check out our Facebook page at https://www.facebook.com/thelunchmaster and Instagram profile www.instagram.com/thelunchmaster. If you are interested in having us serve as your school lunch provider, please check out our website at www.thelunchmaster.com. Thank you!